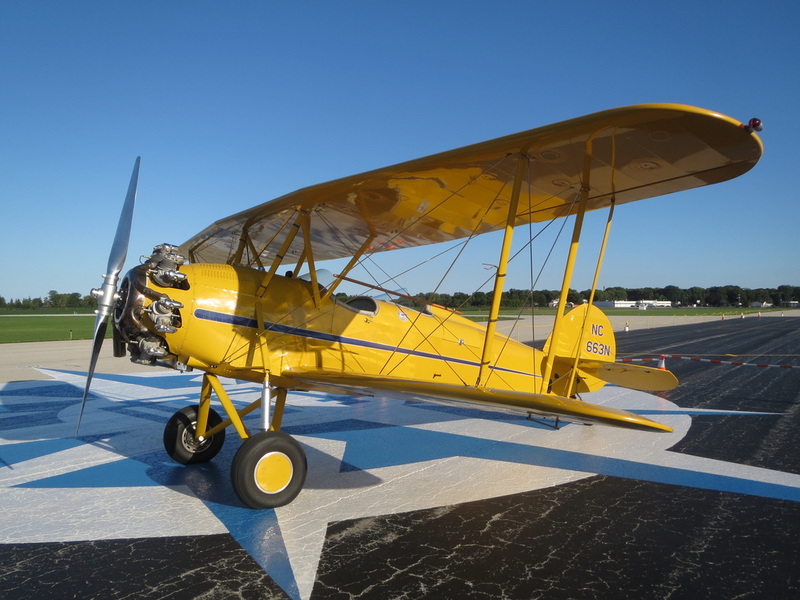 You will be flying in a 1930 WACO Taperwing. NC663N is a WACO ATO, powered by a Wright R-760 Whirlwind. As with many of the aircraft from this generation, her books tell of a sorted past. With three different engine configurations and wings varying from the straight to the tapering variety, 663N has had no problem in adjusting her presence to suit the situation. The Taperwing was the first certificated aircraft to complete an outside loop. Pleasure plane to workhorse, businessman to farmer, this Taperwing has always been able to earn her keep. She once did a stint with agricultural aviation pioneer J.O. Dockery for the company that would become Delta Airlines. After going through an extensive restoration in Creve Coeur, Missouri less than a decade ago, 663N spent time in Lincoln, Nebraska. The Taperwing currently resides in Brodhead, Wisconsin under the care of Gypsy Air Tours, members of EAA Chapter 431 of the Experimental Aircraft Association and is located on one of the best grass airstrips in the Midwest open to the public at Brodhead Airport which has been home to generations of aviators. We consider it a great privilege to further preserve and contribute to the history, lore, and beauty of such an iconic aircraft. For large groups and special events, we can bring along our friend and his 1928 New Standard biplane. Established in 2011. We acquired the WACO Taperwing biplane in the fall of 2010. We filed as an LLC in 2011 and flew our first season of tours and sightseeing flights that year. We have offered flights each year since during open-cockpit season.